Teddy Bridgewater is the second year quarterback for the Minnesota Vikings. The Louisville alum started 13 games last season, throwing 14 total touchdown passes. This productivity earned Bridgewater the 2014 Pepsi Rookie of the Week award twice (week 4 and week 13). After the season ended, Bridgewater was named the 2014 Pepsi NFL Rookie of the Year. Above is an iFolloSports.com original photo of Bridgewater's top rookie trophy. 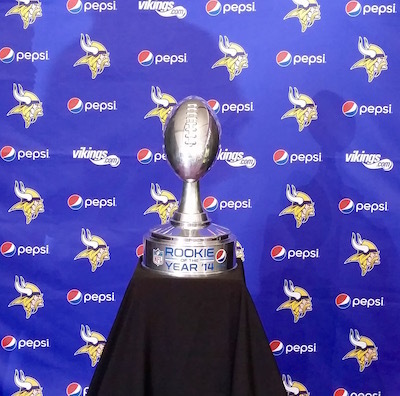 The award was displayed for fans at the Vikings training camp village store, in Mankato, Minnesota. Viking fans hope Bridgewater and the team can build on last year's 7-9 record.